Creative Micro Designs (CMD) has worked for years to improve the user interface to Commodore floppy disk drives and to improve their performance. Now CMD has taken the sum of its Commodore disk drive knowledge and expertise and condensed it into its HD Series of hard drives for the 64 and 128. By doing so, CMD hopes to extend the useful life of the 64 and the 128 well into this decade. After having worked with a 20-megabyte version of the CMD HD Series hard drive, I think CMD has an excellent chance of doing just that. Compatibility is the biggest hurdle to overcome when designing a mass storage device for Commodore 8-bit computers. The 1541, the basic Commodore disk drive, has a unique way of formatting and storing data on a floppy disk. Since the 1541 is considered the bottom line for the 64, most software developers have chose to adopt its format in order to ensure compatibility with the largest number of machines. Unfortunately, the 1541's 170-kilobyte storage capacity, along with its limited data-transfer speed, is considered inadequate by to day's standards. Interestingly enough, it was Commodore's introduction of the double-capacity 1571 disk drive followed by the 800-kilobyte 1581 drive that relaxed the compatibility requirements. This relaxed compatibility approach was taken by CMD when designing the operating system for its HD Series of hard drives. CMD has chosen to design its HD Series around the SCSI standard. As a result, although the storage capacity of the basic HD drive can be as small as 20 megabytes, the system can be expanded theoretically to a total of four gigabytes (a gigabyte is 1,000 megabytes, or more than a billion bytes) spread over as many as 13 physical hard drives. At the risk of having to eat my words later, I will state that four gigabytes is more online capacity than any 64 user will ever need. Physically, the HD is not much larger than a 1581. The external dimensions of its all-metal case are 2.75 inches high, 5 inches wide, and 10 inches deep. The system is FCC certified to meet the limitations on radio interference. Its external power supply, about half the volume of the HD, is U/L certified and provides power at 5 volts, 12 volts, and -12 volts. The power supply has its own on/off switch and is fitted with six-foot long input and output cables. The HD also has its own on/off switch on its back panel. CMD recommends that the drive be turned on and off via its own power switch. The power supply should be left on to extend the life of the back-up battery for the HD's built in realtime clock. The HD's front panel is a flat-membrane keyboard that sports eight indicator lights and four push buttons. The lights indicate power (on), activity (two lights), errors, and GEOS. These are followed by push buttons for SWAP8, SWAP9, and WRITE PROTECT, each with an associated indicator light and a RESET button. In addition to their designated functions, the lights flash through a diagnostic pattern whenever the HD is powered up. The unique SWAP8 and SWAP9 buttons enhance the HD-20's compatibility with existing software. When one of these buttons has been pressed, the HD's serial bus device number is changed, however, to the corresponding value. If another disk drive set to either device 8 or device 9 is already connected to the serial bus, its device number will be exchanged automatically with the HD-20's. The HD-20's default device number is 12. This can be easily changed to any other device number from 8 to 30 through software control. The HD's back-panel connectors include a four-pin power plug and a pair of standard six-pin serial bus connectors. The official capacity of the Commodore serial bus is four devices; however, I was able to run the HD-20 (device 12) on a 128 with a pair of 1571 disk drives (devices 8 and 9), a 1581 disk drive (device 10), and a Xetec Super Graphix printer interface (device 4) without any problems. The remaining back-panel connectors are unique to this drive. A six-pin auxiliary port, which is physically identical to the six-pin serial bus connectors, is for future versions of the operating system that will allow the HD to intercept and store data being sent to device 4 or 5 and then spool it out to the printer. A round, 14-pin, parallel port connector is for the just-released RAMLink parallel interface between the HD and the 64/128. RAMLink has space for up to four megabytes of RAM and can be used to boost data-transfer speeds between the computer and the hard disk drive. Last, but not least, a 25-pin SCSI connector on the back panel lets you connect up to six additional SCSI devices to the HD-20. Since SCSI ports are inherently bidirectional, you can actually use this connector to access the HD-20 from another computer equipped with a SCSI interface. Thus, it's possible to utilize the hard disk drive in the HD-20 with more than one computer system. In order for this to work, each computer has to be careful not to trash the parts of the hard drive that are used by the other system. Inside the HD-20, the connection between the system's electronics and the 20-megabyte Conner hard drive is made via a standard 50-pin SCSI connector and a short flat ribbon cable. If you know what you're doing, you can daisychain additional SCSI drives to the system by using the internal 50-pin connector. Since there is no space inside the HD-20 for additional hard drives, you'll have to pass the ribbon cable to the outside of the case. You'll also have to provide power and an enclosure for the external hard drive. Of course this setup will also violate the HD's six-month warranty and will probably compromise the integrity of the system's radio frequency shielding. Therefore, I do not recommend this approach to the average user, although I suspect that there are plenty of hackers who will take advantage of the available hardware. Like all other Commodore 8-bit disk drives, the HD hard drive is an intelligent device with its own DOS in 16 kilobytes of ROM and its own 6502 microprocessor running at 2 MHz with 64 kilobytes of RAM. 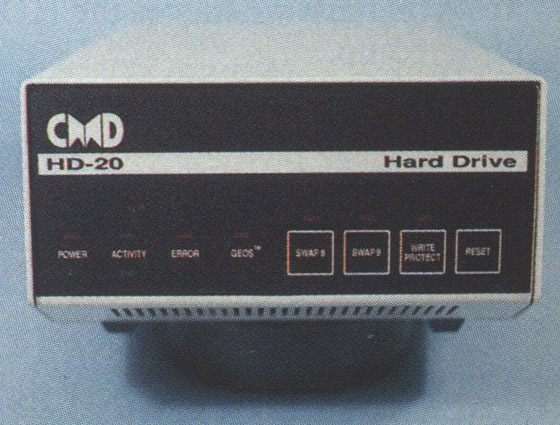 In effect, the HD is a stand-alone microcomputer. The input/output hardware consists of a pair of 6522A VIA chips and an 8255 chip. Most of the HD's DOS is actually stored on a small part of the hard drive. The operating system's program code is downloaded into part of the HD's RAM when it's powered up. By placing a part of the operating system on the hard disk, CMD is able to upgrade the system by simply sending a floppy disk to the end user. Installing the updated operating system is a very simple process that takes only a few minutes and does not affect any of the data already stored on your drive. CMD has given a lot of thought toward maintaining the compatibility of the HD-20's operating system with existing 64/128 software. In general, any software that does not rely on disk-based copy protection and uses any of the standard Commodore DOS functions can be transferred to and run from the CMD hard drive. It's safe to say that any software originally distributed on a 1541 floppy disk that you've been able to copy successfully onto a 1571- or 1581-format floppy disk should run from the HD-20. The 20-megabyte capacity of the hard disk drive cannot be accessed as a single chunk. Instead, the HD-20's operating system divides up the available space into partitions. You can choose from a variety of partition types, depending on your needs. Native partitions can be as small as 256 blocks (64 kilobytes) or as large as 65,280 blocks (about 16 megabytes). They can store more than 59,000 files, any one of which can be as large as the entire partition. Relative files in a native partition can have as many as 65,535 records. Native partitions also support true subdirectories similar to those used with MS/DOS or AmigaDOS systems. The HD also supports partitions that mimic the 1541, 1571, and 1581 disk drives. These partitions have all of the characteristics of the original disk drives, such as storage capacity and file-size limitations. The 1581 partitions even support 1581-style subdirectories. Compatibility with the various drives has been maintained by supporting all Commodore DOS functions, including the various direct disk access commands and the direct memory access commands. For 128 users, the 1571 and 1581 burst-command instruction set is supported with the exception of the MFM formatting commands. It would make no sense to support the MFM formatting commands because the drive medium in the HD is fixed. CMD has even gone so far as to emulate 1541, 1571, and 1581 job queue instructions. To the 64 or 128, the HD looks like a multiple floppy disk drive with up to 254 drive units. Think of the HD as a floppy drive with units numbered between 0 and 254. You do not have to have 254 partitions, though; just create as many as you want using the provided software. The current partition is the one that responds as drive 0 to the 64/128. You can make any partition the current partition by issuing an instruction over the HD's command channel. You can also set any of the partitions to be the current partition when the drive is powered up. Thus, any software that lets you issue standard Commodore DOS commands can access any of the HD partitions. It's also possible to change the current partition via the push buttons on the HD's control panel. But the procedure is cumbersome, as it requires the entry of the partition number as three binary digits using the front panel's indicator lights. To use GEOS with the HD, replace the GEOS Configure program with the one provided by CMD. You also install the CMD HD Time program on your GEOS boot disk, which lets GEOS automatically set its clock from the HD's built-in realtime clock. GEOS can only access 1581 partitions on the HD. Thus, to GEOS the HD looks like a 1581 disk drive whose floppies are changed with the CMD QuickMove utility. QuickMove also lets you copy GEOS files between 1581 partitions on the HD. It's also possible to boot GEOS directly from the HD. According to CMD, the Maverick utility, available from Software Support International, can be used to install GEOS onto a 1581 partition. If you have the May 28, 1987, version of CP/M Plus 3.0, you'll be able to access 1541, 1571, and 1581 CP/M partitions on the CMD. Note that the 1581 CP/M partition can only be accessed from CP/M, as it isn't the same as a standard 1581 partition. Earlier versions of CP/M can only access 1541 and 1571 partitions. As with GEOS, CP/M treats the HD as another floppy disk drive whose disks can be changed under software control. The SPORT.COM utility is a CP/M program provided with the HD that issues Commodore DOS commands via the serial port. SPORT.COM is used to swap partitions on the HD under CP/M. A set of generic utilities comes with the HD in addition to specific utilities for GEOS, CP/M, and QuantumLink. These utilities include a versatile file copier; a whole disk copier that can duplicate a 1541, 1571, or 1581 floppy disk into the corresponding HD partitions; and a variety of partition and HD system-maintenance utilities. Most of these utilities come in both 128 and 64 versions. In general, the utility programs are easy to use with onscreen menus and built-in prompts. Since the HD supports the serial port's burst modes, it works very well with the 128. However, the 64 lacks the burst-mode hardware, which limits its data-transfer speed over the serial port. CMD's JiffyDOS greatly improves the performance of the HD with a 64. JiffyDOS consists of a replacement ROM chip for the computer's operating system. To install it, you'll have to open your computer and replace the existing ROM. You'll also have to replace the ROM in your floppy disk drive. On the 128, separate ROMs are provided for the 64 and the 128 modes. Replacing the ROMs can be a problem if the original chips in your particular model are soldered in or if you aren't familiar with handling semiconductor components. Serial-port transfer speeds between the HD and the computer are the same as for a 1541 disk drive when run with a stock 64. On a 128, transfer speeds were comparable to a 1581. Internal drive operations, such as formatting a partition, generally take only a few seconds. Loading a 150-block file from the HD, with JiffyDOS, takes only 5 seconds. Saving the same file to the HD, with JiffyDOS, takes 19 seconds. Booting CP/M from an HD partition requires only 24 seconds. Copying a double-sided 1571 disk to an HD partition, using the included MCOPY whole disk copy program, requires only 74 seconds. Copying a 1581 disk to an HD partition using MCOPY takes 81 seconds. 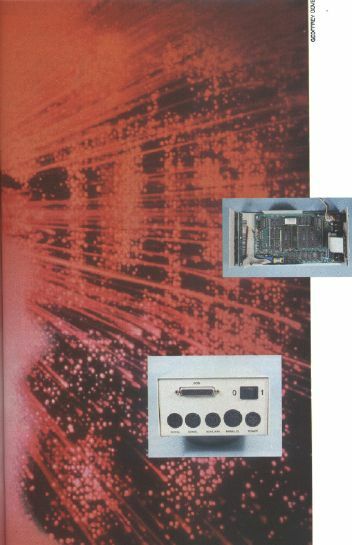 CMD has done an excellent job of designing a SCSI hard drive interface for the 64/128 computers. It has addressed compatibility issues by providing both hardware emulation and custom software. In general, the limitations of the system are due to the built-in limitations of the Commodore operating system. Standard capacities of 20, 40, and 100 megabytes.